Update! According to reports of users the Cerber2 ransomware doesn’t seem to seek for temporary files (.tmp). That makes possible for the recovery of some recent .doc and .xls files by just opening their .tmp counterpart files. The talking ransomware is back with a bang – malware researchers from TrendMicro got their hands on samples of Cerber2 ransomware and have confirmed that it is the real deal. They have observed an enhancement in the key generation function, so it can be harder for the researchers to decrypt this version. This new variant of Cerber ransomware encrypts a little over than 450 file types and gives five days to victims to pay up. The ransom which is asked initially is 175 US dollars and demanded to be paid in Bitcoins. After exactly five days the price doubles. Carefully read the article to see how to remove the ransomware and possibly decrypt your files. 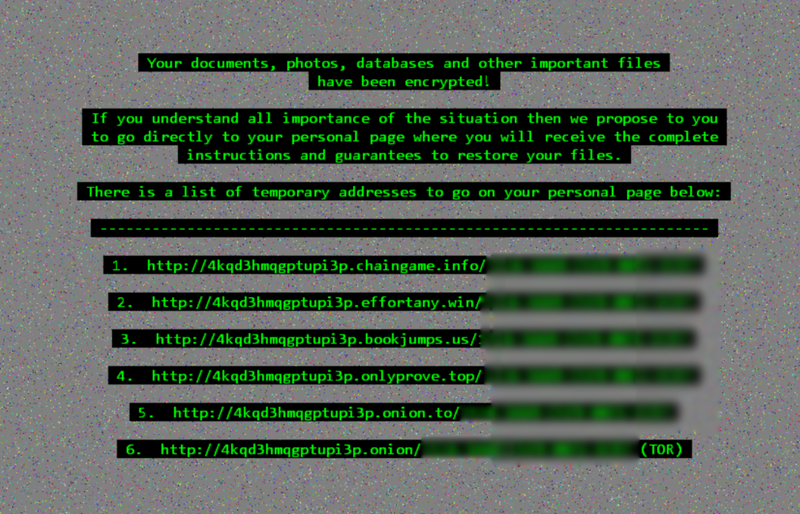 Short Description The ransomware will encrypt your files and show a ransom note. You are given five days to pay, and after that period the ransom price doubles. Symptoms The ransomware will encrypt files, and change their names with 10 random characters and the .cerber2 extension appended to each of them. User Experience Join Our Forum to Discuss Cerber2. The Cerber2 ransomware has been spotted in the wild, spreading through executables, which use the icon of “Anka”. That is a video game character from the game bearing its name, and you can see an example of how the icon could look like, here on the right. The ransomware might spread the executable through spam email campaigns – putting the file as an attachment. Opening attachments of unknown origin or ones that come from suspicious emails is not advised. Social networks and file-sharing services could also have such files inside them, so be wary of what you click, download and open. Exploit Kits could be a possible entry point for the ransomware. Cerber2 is the latest variant of Cerber ransomware. That was confirmed by the TrendMicro researcher @panicall who received samples of the malware and had a thorough look at it. He also found that Cerber2 ransomware has a blacklist for anti-malware programs (listed below) and that the ransomware is now wrapped (and not a bare file) to make it harder to be detected. Your documents, photos, databases, and other important files have been encrypted! If you understand all importance of the situation then we propose to you to go directly to your personal page where you will receive the complete instructions and guarantees to restore your files. Upon loading, the web page initiates the countdown counter of a five-day “promotion”. The price that is asked in the beginning is 0.30 Bitcoins and amounts to 175 US dollars. If you go past that date without paying the crooks, your price will be double and amount to 350 US dollars. It is not advised to pay cybercriminals – do not pay them, as this will support them and aid their goals and criminal activity further. 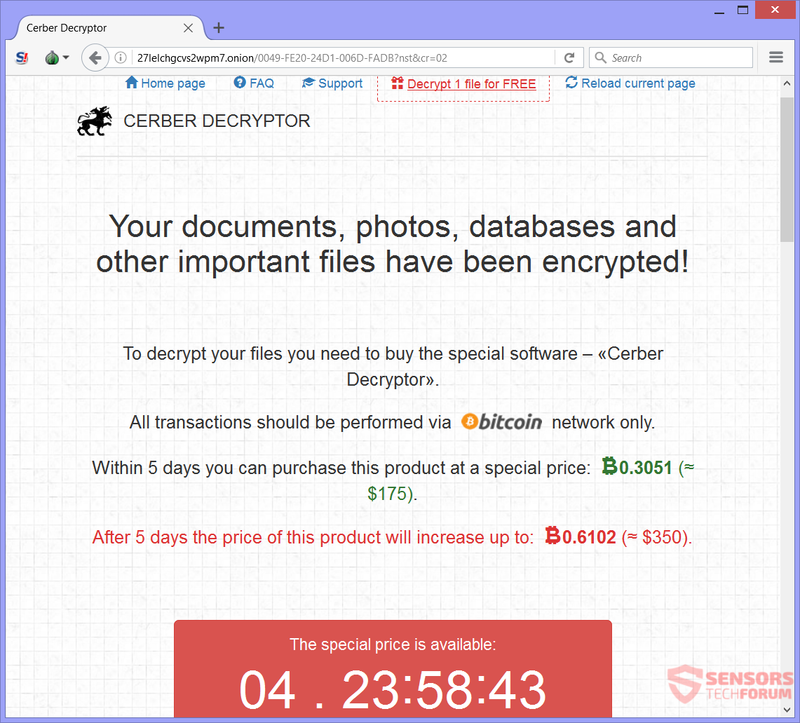 Cerber2 ransomware searches files and encrypts more than 450 file extensions. All files will get encrypted with the .cerber2 extension. In addition, the file names are renamed with ten random characters. The Cerber2 ransomware is reported to uses Windows API CryptGenRandom to generate keys. This variant uses 256-bit keys. It is unknown whether Cerber2 ransomware deletes Shadow Volume Copies from the Windows operating system, but the possibility is very high. If your computer got compromised and is infected with the Cerber2 ransomware, you should have some experience with removing malware before dealing with it. You should get rid of the ransomware quickly before it can spread further on the network and encrypt other files. The recommended action for you to take is removing the ransomware completely by following the step-by-step instructions guide written down below. Threats such as Cerber2 may be persistent. They tend to re-appear if not fully deleted. A malware removal tool like Combo Cleaner will help you to remove malicious programs, saving you the time and the struggle of tracking down numerous malicious files. Threats such as Cerber2 may be persistent on your system. They tend to re-appear if not fully deleted. A malware removal tool like SpyHunter will help you to remove malicious programs, saving you the time and the struggle of tracking down numerous malicious files. Note! Your computer system may be affected by Cerber2 and other threats. SpyHunter is a powerful malware removal tool designed to help users with in-depth system security analysis, detection and removal of threats such as Cerber2. 1. Install SpyHunter to scan for Cerber2 and remove them. 2. Scan with SpyHunter, Detect and Remove Cerber2. Ransomware infections and Cerber2 aim to encrypt your files using an encryption algorithm which may be very difficult to decrypt. This is why we have suggested several alternative methods that may help you go around direct decryption and try to restore your files. Bear in mind that these methods may not be 100% effective but may also help you a little or a lot in different situations. Note! Your computer system may be affected by Cerber2 or other threats. Remove Cerber2 by cleaning your Browser and Registry. Fix registry entries created by Cerber2 on your PC. Combo Cleaner is a powerful malware removal tool designed to help users with in-depth system security analysis, detection and removal of threats such as Cerber2. Step 5: In the Applications menu, look for any suspicious app or an app with a name, similar or identical to Cerber2. If you find it, right-click on the app and select “Move to Trash”. Step 6: Select Accounts, after which click on the Login Items preference. Your Mac will then show you a list of items that start automatically when you log in. Look for any suspicious apps identical or similar to Cerber2. Check the app you want to stop from running automatically and then select on the Minus (“–“) icon to hide it. Remove Cerber2 – related extensions from your Mac’s browsers. A pop-up window will appear asking for confirmation to uninstall the extension. Select ‘Uninstall’ again, and the Cerber2 will be removed. When you are facing problems on your Mac as a result of unwanted scripts and programs such as Cerber2, the recommended way of eliminating the threat is by using an anti-malware program. Combo Cleaner offers advanced security features along with other modules that will improve your Mac’s security and protect it in the future. Unfortunately, I can confirm that Cerber2 ransomware deletes Shadow Volume Copies from the Windows operating system. At least, it’s what happened on my PC. What actions have you taken so far? First of all, I got rid of the ransomware with SpyHunter (Enigma Software) and restore my registry with RegHunter (Enigma Software). Then I tried, without much success, to restore the encrypted files with: Stellar Phoenix Windows Data Recovery, Recuva, EaseUS Data Recovery and Jihosoft File Recovery… In fact, I was only able to restore a few pictures (maybe 50 out of 1000 !!!). On the other hand, I have to say that Stellar Phoenix helped me restore some important .doc (Microsoft Word) and .pdf files. Also, take note that Cerber2 doesn’t seem to search for Word temporary files (.tmp). So it’s possible to recover some of your recent .doc files by simply opening the .tmp files. Thank you for the information! And don’t forget to backup your data from now on! Hey !, I found this information for you: "Remove Cerber2 Ransomware and Restore .cerber2 Encrypted Files". Here is the website link: https://sensorstechforum.com/remove-cerber2-ransomware-restore-cerber2-encrypted-files/. Thank you.